Swedish meatballs and gourmet breads-all under one roof. 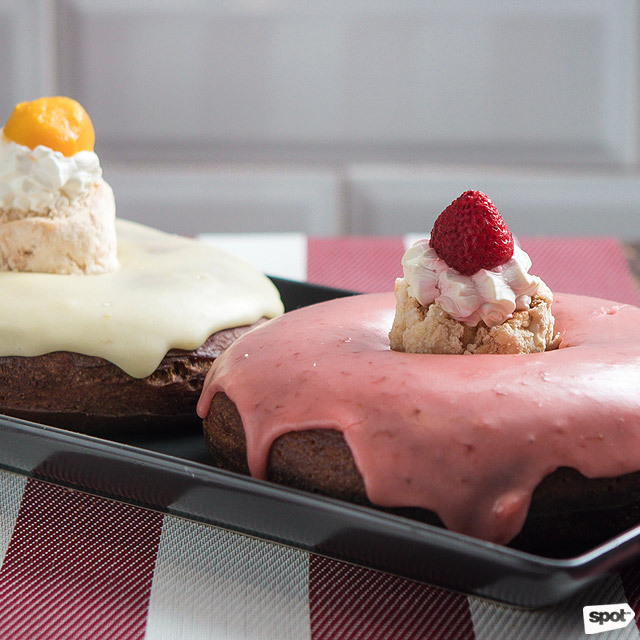 (SPOT.ph) Sheer curiosity may lure you inside this new bakery at SM Aura Premier, but it will be the tempting smell of freshly baked pastries that would entice you to stay. 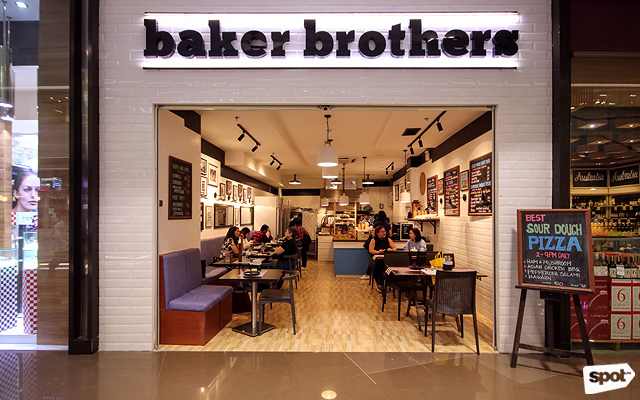 With their simple black-and-white signage, chalkboard menus, and plain white brick walls, Baker Brothers gives off that warm and cozy vibe—despite the mall's busy background—which you’ll typically notice in European cafés. 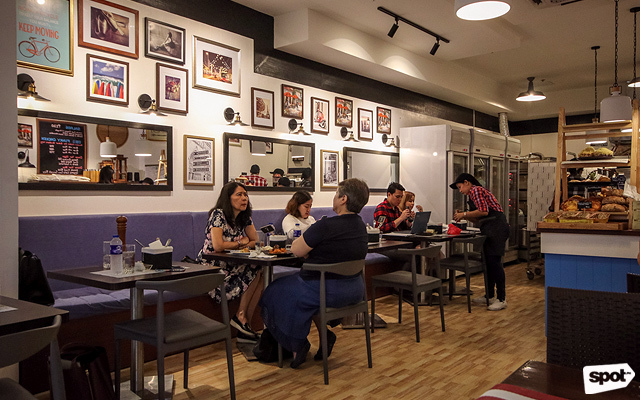 The homegrown restaurant is the brainchild of Swedish chef Robert Lilja, who has been living in the Philippines for almost three decades now. Having worked as a private chef and a culinary consultant for local hotels and restaurants, Chef Robert has grown familiar with the Filipino palate, or the love for anything sweet and salty—the attention to umami. 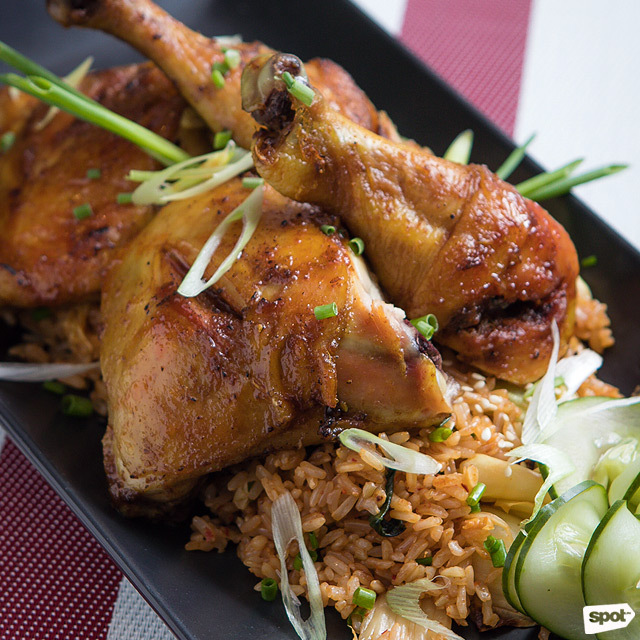 Putting progressive Filipino cuisine under the limelight, Baker Brothers makes use of local and ethically produced ingredients to support local farmers and purveyors. “We give some popular dishes a twist to enhance them and make them new and better,” Chef Robert shares. Baker Brothers' Native Chocolate with Sili has just the right amount of heat and sweetness. There’s the Honey & Calamansi Ensaymada (P120), which features the local citrus. 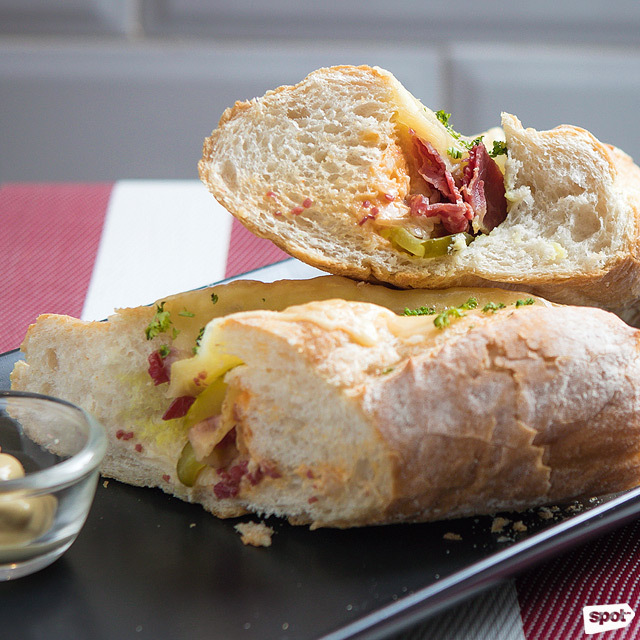 Served warm, fluffy, and oh-so cheesy, it’s best paired with a cup of coffee. 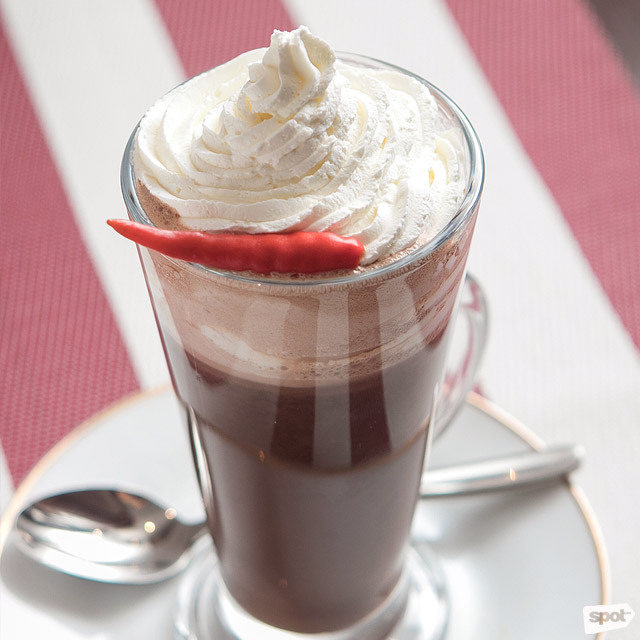 The café uses a strong blend of locally sourced beans that are exclusively roasted for the restaurant. 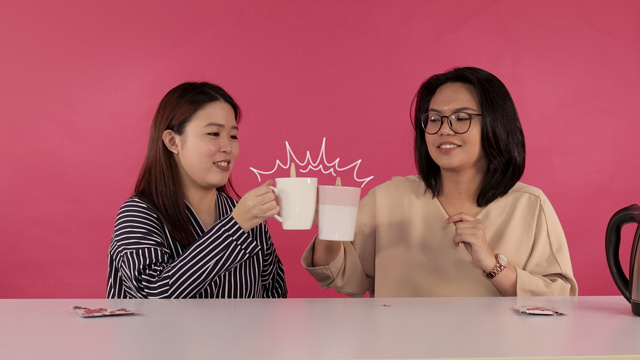 A sweeter and more adventurous alternative would be the Native Chocolate with Sili (P150)—a thick mixture of powdered Davao chocolate and chili that's not too sweet and has just the right amount of heat. These Swedish Meatballs are an explosion of flavors: Savory, sweet, tangy. If you’re looking for something tasty but hefty, take your pick from their menu of Asian and European flavors. 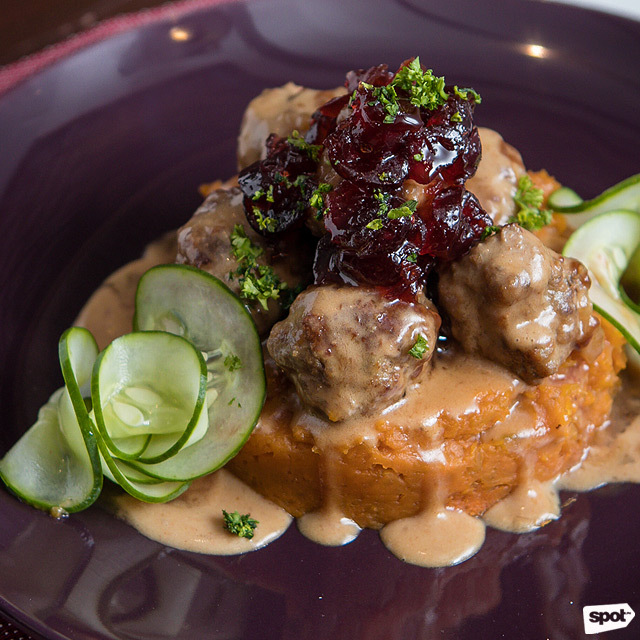 The restaurant has their own version of the popular Swedish meatballs, which uses sweet-potato mash instead of mashed potatoes, and cranberries instead of lingonberries. It may not be traditional, but Baker Brothers’ Swedish Meatballs (P320/single, P580/sharing) will surely hit the spot for its savory beefy flavor contrasted by the natural sweetness of the berries. The Spicy Cashew Chicken will wake up your taste buds in no time. Spicy food lovers will appreciate the Spicy Cashew Chicken (P290/single, P540/sharing). 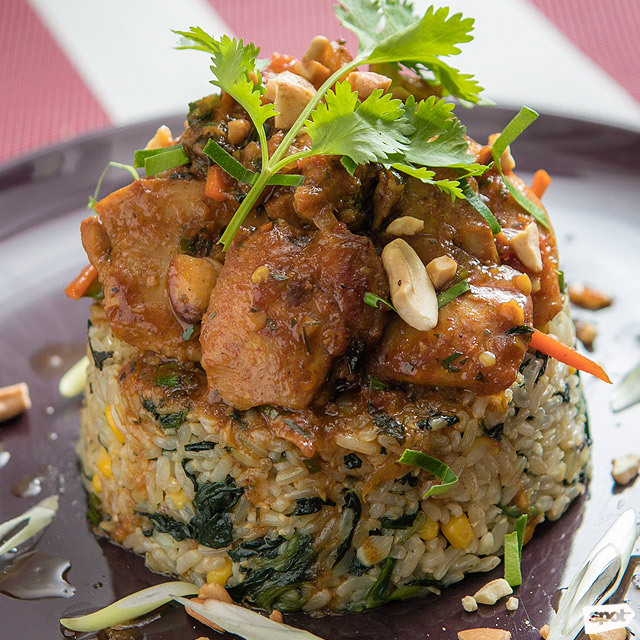 Don’t worry, the heat is tolerable, and you’ll like the combination of tender, boneless chicken slices with crunchy bits of cashew, served with spinach and corn brown rice. If you're looking for sinigang's signature sour flavor, the Corned Beef in Sinigang Gravy has it. Another standout is the Corned Beef in Sinigang Gravy (P295/single, P550/sharing). 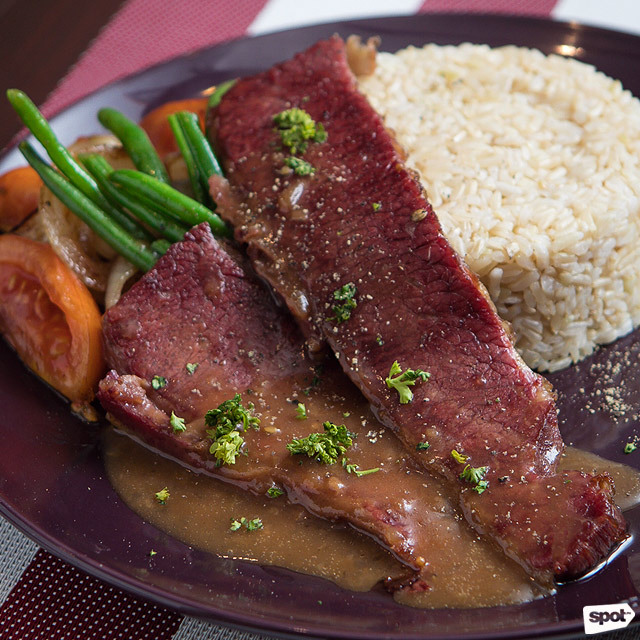 You won’t find canned corned beef here—served with veggies and organic brown rice, the succulent beef slices are doused with a thick brown gravy that has that distinctive sour flavor of sinigang. And although it’s a “soupless” sinigang, it’s just as good and comforting as the ones you have at home. This creamy mushroom soup is a meal on its own! 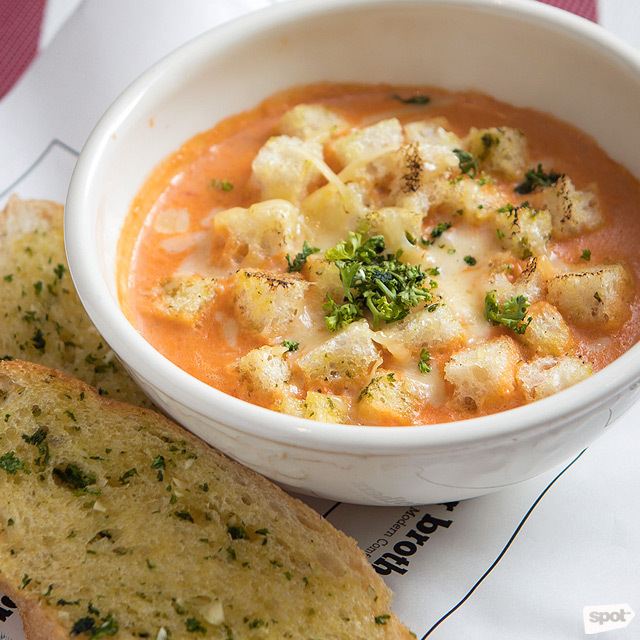 You'd want to dive into the cheesy center of this Cream of Tomato. In case you’re really hankering for soup or something to warm you up, go for the Three Wild Mushrooms (P220) or Cream of Tomato with Cheese and Garlic Croutons (P220). 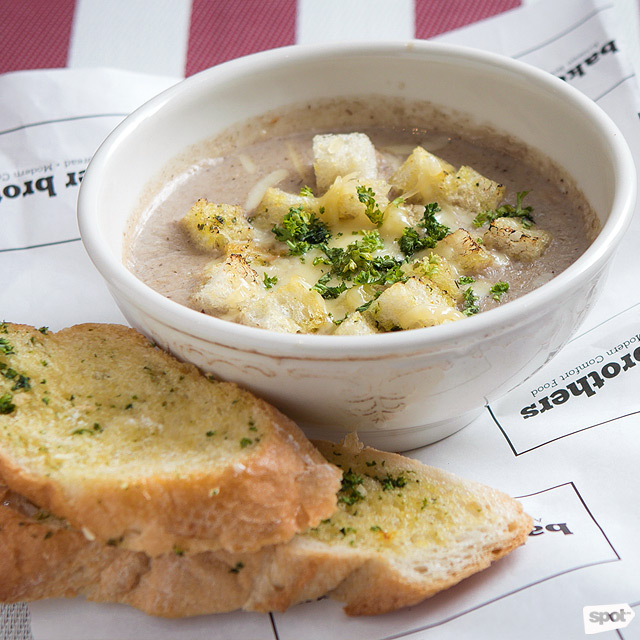 Both soups are creamy and made more filling with garlic bread on the side, not to mention the sourdough croutons and cheese hidden in the bowl. 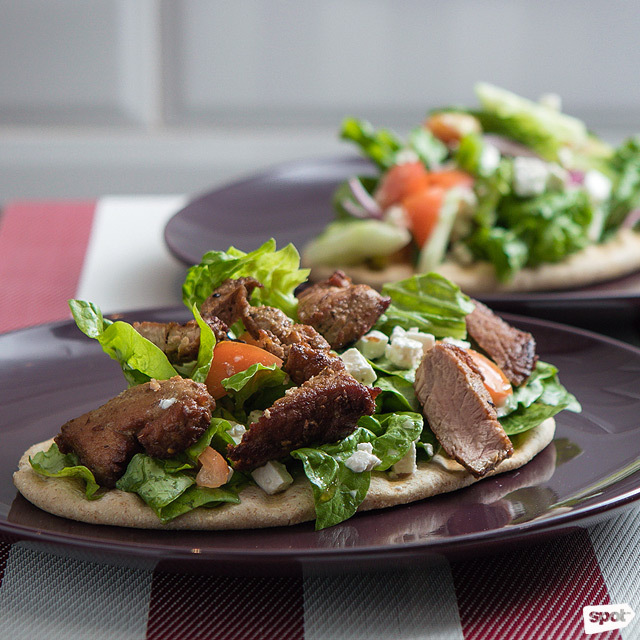 The Souvlaki Steak is perfect for meat lovers. Baker Brothers' Reuben is a lighter version of the classic American sandwich. To complement these hot bowls are their grilled flatbreads, like the protein-packed Souvlaki Steak (P280), with juicy morsels of grilled steak marinated in an herby Greek-style dressing, or the Vegetarian (P240), a lighter option—all come with a mix of veggies and goat cheese. They’ve got sourdough sandwich specials as well, like the Reuben (P230), which has all the basic components of the classic American sandwich: Salty corned beef, zesty sauerkraut, and milky Swiss cheese. This one's best eaten once it lands on the table. 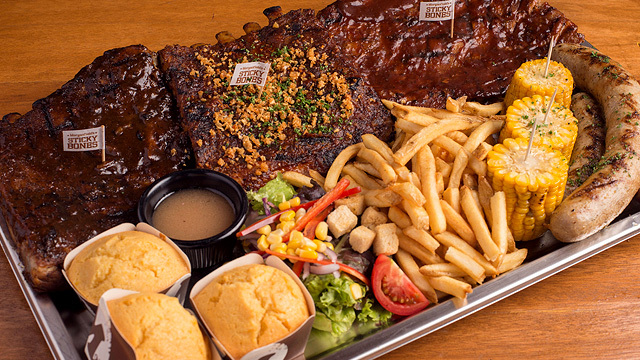 You'll have fun mixing and matching the sauces of BB's Funky Chicken. The BB’s Funky Chicken (P290/two pieces with rice) lets you customize and have a bit of fun. Dip it in your preferred sauce: Honey Sesame Chili, Five Alarm Chili, or Herb and Calamansi. Whether you pick the kimchi fried rice or spinach and corn brown rice, you’ll leave satisfied. Baker Brothers also accommodates special requests, whether you’re on a Keto, gluten-free, or Paleo diet. They’ve got take-out specials and homemade cold cuts and spreads, too, which you can bring to your next potluck! 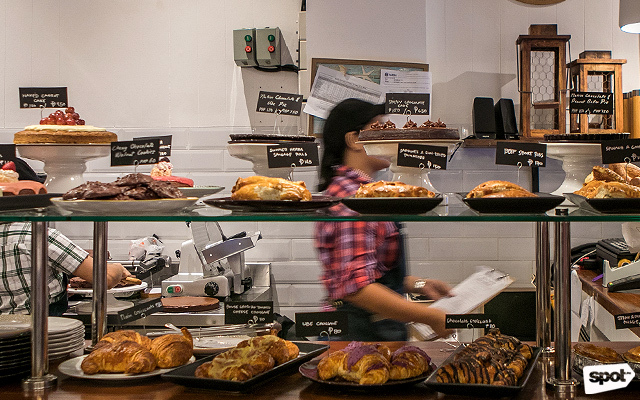 Another pro tip: Baker Brothers offers a 50% discount on selected breads and pastries every day, starting at 8 p.m. 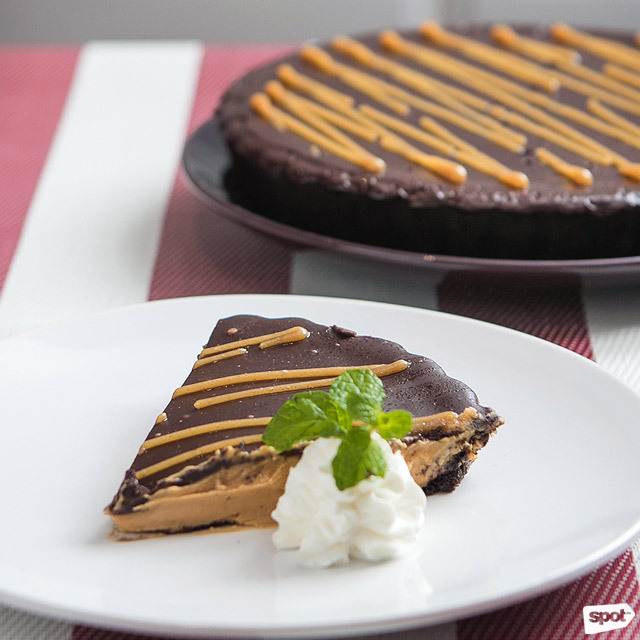 This chocolate and peanut butter pie will remind you of a classic childhood snack. 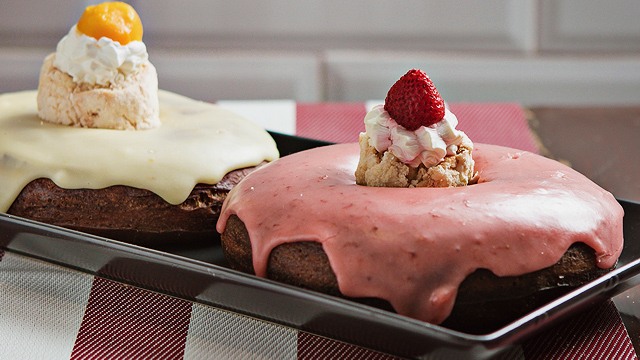 Baker Brothers' Doughnuts (P160/piece) are as big as plates! But please, make room for their decadent desserts, which you’ll have a hard time finding elsewhere. They’ve got whole-wheat doughnuts as big as dinner plates, savory and sweet croissants (hello ube croissant! ), a chocolate and peanut butter pie that will remind you of Reese’s, and a bevy of treats that are updated regularly. If you feast with your eyes first, you’ll be full even before you start with your meal here.